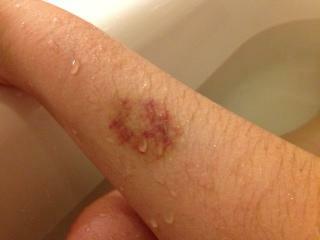 This is a bruise in my right arm from one of my 16 needle pokes when they were trying to take a bunch of blood on me. This entry was posted in Medical Events, Uncategorized, Update on my Symptoms. Bookmark the permalink.